In the decades following World War II, cities across the United States saw an influx of African American families into otherwise homogeneously white areas. This racial transformation of urban neighborhoods led many whites to migrate to the suburbs, producing the phenomenon commonly known as white flight. In Block by Block, Amanda I. Seligman draws on the surprisingly understudied West Side communities of Chicago to shed new light on this story of postwar urban America. Seligman’s study reveals that the responses of white West Siders to racial changes occurring in their neighborhoods were both multifaceted and extensive. She shows that, despite rehabilitation efforts, deterioration in these areas began long before the color of their inhabitants changed from white to black. And ultimately, the riots that erupted on Chicago’s West Side and across the country in the mid-1960s stemmed not only from the tribulations specific to blacks in urban centers but also from the legacy of accumulated neglect after decades of white occupancy. 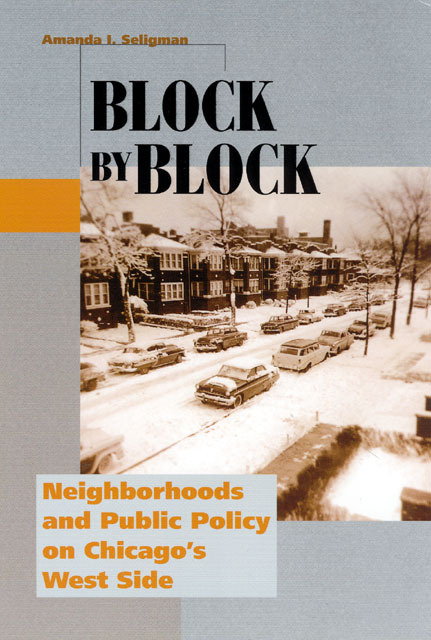 Seligman’s careful and evenhanded account will be essential to understanding that the "flight" of whites to the suburbs was the eventual result of a series of responses to transformations in Chicago’s physical and social landscape, occurring one block at a time. "A creative reinterpretation of the postwar urban crisis, Seligman’s book challenges the one-dimensional portrait of Chicago’s West Side. Her multiplicity of stories and experiences makes this a very rich urban history. Original and useful, Block by Block is an important contribution to postwar urban historiography." "A fascinating account of Chicago’s West Side in the postwar era. Based on a wide range of sources, Block by Block tells the story of a city in flux and residents trying to cope with changes occurring all around them. The emergence of a West Side ghetto is seen within the very real national and local political limits of the Daley era." "Seligman’s deeply researched and well-focused study of race and residence in postwar Chicago usefully stretches the discussion in three directions. Geographically, she provides a real service by concentrating on the city’s understudied West Side. Second, she carries the story down to the mid-1970s, significantly extending our field of vision. Finally, she removes the housing issue from its traditional policy vacuum. These are all welcome developments that will generate questions to engage scholars for years to come." "An impressively researched, highly persuasive survey of 1950s/1960s-era neighbourhood change." "This is a good urban history that takes a new approach to the lives of lower and middle class whites living in urban America after World War II." "An important study that advances our understanding not only of housing desegregation on Chicago’s West Side, but also of the complexities of race, suburbanization, community activism, and big-city politics in urban America. Block by Block is a vital work that should be on the bookshelf of anyone with a serious interest in post-World War II urban history." "This book affords a fresh and unique perspective on a troubled era in the history of America’[s streetcar suburbs.